Zhumell's headquarters are located in Omaha, USA and whilst it is probably true to say that Zhumell is not the most widely known optical brand, they have a good reputation for producing good quality telescopes, spotting scopes, riflescopes as well as binoculars with an emphasis on good value for money. This is highlighted in their marketing, as they say Zhumell started after they asked themselves if they could produce binoculars that were better value for money than what was currently available but still better than the ordinary. Zhumell binoculars are in no way a match for the top of the range, Swarovski's, Leica's or Zeiss binoculars and to be fair they don't aim for that market. Their binoculars are aimed at the mid to cheap range of binoculars and here they do offer plenty in the way of quality components, workmanship and features that you don't always find in binoculars in the same price range which indeed does make them great value for money. Zhumell currently have six types of binocular in their range and whilst they may not offer the most comprehensive portfolio, they do have the major bases of General Use, Wildlife, Birding, Marine and Atronomical binoculars covered. Their Signature range is aimed at the general use, birding and wildlife observation markets, whilst the Astronomical line consist of astronomy binoculars that are an affordable alternative to telescopes The Waterproof line consists of specialist marine as well as general use binoculars that can handle even the nastiest weather and are both fog and waterproof. 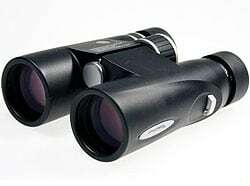 The Compact line consists of... you guessed it... compact binoculars, ideal for travel and everyday hastle free use. Perhaps most unique to Zhumell is their specialty binoculars that includes opera glasses. Zhumell also prudoce a range of coin operated binoculars aimed at the tourism market. The Zhumell Signature Series waterproof binoculars are as their name implies Zhumell's flagship range. They are also their most expensive standard binoculars aimed at the mid priced market and come loaded with features that can be difficult to find in binoculars at this price range. These features include fully multi-coated lenses, they are o-ring sealed as well as nitrogen purged making them not only fully waterproof, but fog proof as well. Zhumell also back their Signature binoculars with their 25-year no-fault warranty that ensures a lifetime of worry-free viewing and both full size 42mm models weigh 1.8lbs (680g) making them pretty lightweight too. 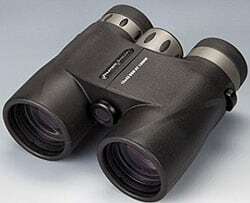 These are ideal as general use, wildlife and birding binoculars. 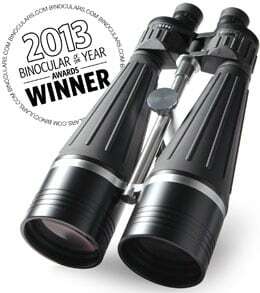 Winner Binoculars.com's Best Astronomy Binocular 2010, 2011 and 2013! The Tachyon 25x100 Astronomical binocular has a rugged metal construction and comes with a powerful 25X magnification and large 100mm objective lenses and a built-in tripod adapter. This amount of power is more than enough to pick out craters on the moon, features on the planets and even good views of interstellar objects. What is also interesting is they accept the standard, 1.25-inch astronomical filters to enhance your views of the Moon, planets nebulae and other celestial bodies. Other features include fully multi-coated lenses, quality BAK-4 prisms, individual focus for precise adjustment. They are fully waterproof and nitrogen-purged to prevent any fogging up. They're also backed by Zhumell's 25-year warranty. Whilst these SuperGiant astronomy binoculars have smaller objective lenses (80mm) than the Tachyon binoculars from Zhumell, this does mean that they weigh in at just 4.4 pounds, meaning they are small and light enough to use in the field, but of course are best mounted to a tripod and they come with a built in tripod mount that takes any standard photographic tripod for longer periods of observation. High-performance features include: fully multi-coated optics and BAK-4 prisms, and custom adjustment with center and right diopter focus knobs. They have an extra-large field of view with crystal clarity from edge to edge; Ultra-smooth center focus that's easy to operate, allowing you to pinpoint your subject, Right diopter adjustment so you can fine-tune your viewing. 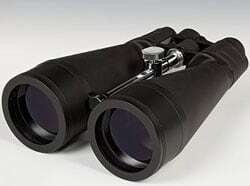 They are perfect for lunar viewing, locating deep space objects, or super-long range terrestrial viewing. The Zhumell Short Barrel waterproof binoculars offer a unique twist to full size 42mm binoculars in that as their name suggests the barrel of the binoculars is shorter than standard making them slightly more portable than true full size binoculars, but still maintain the light gathering qualities and wider field of view when compared to true compact binoculars. 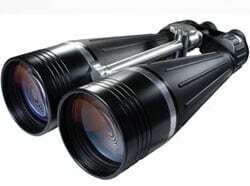 The come in two magnifications 8x and 10x and have multi-coated optics.